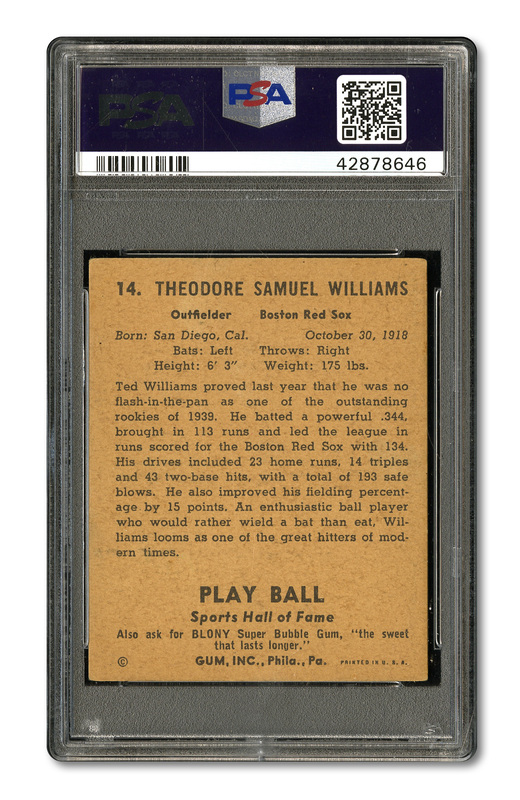 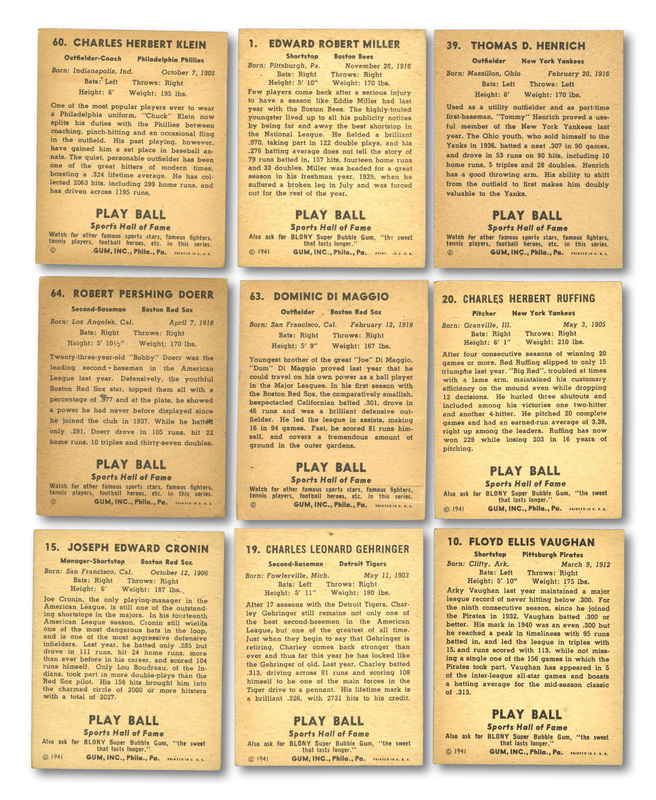 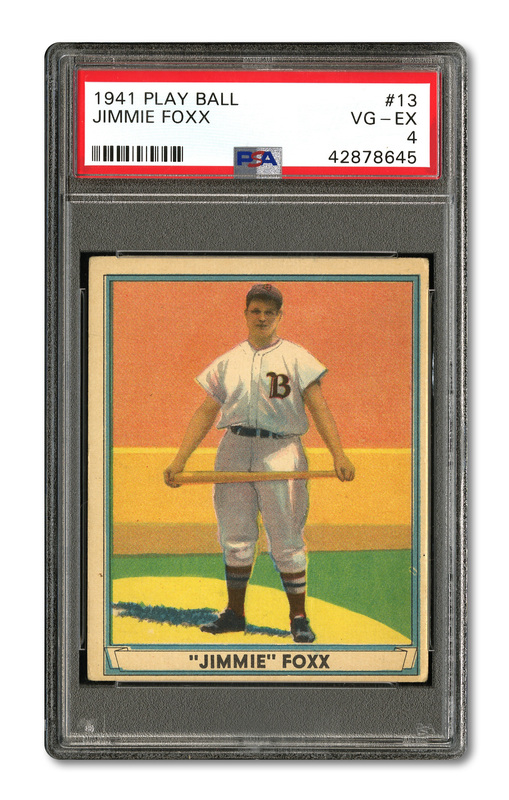 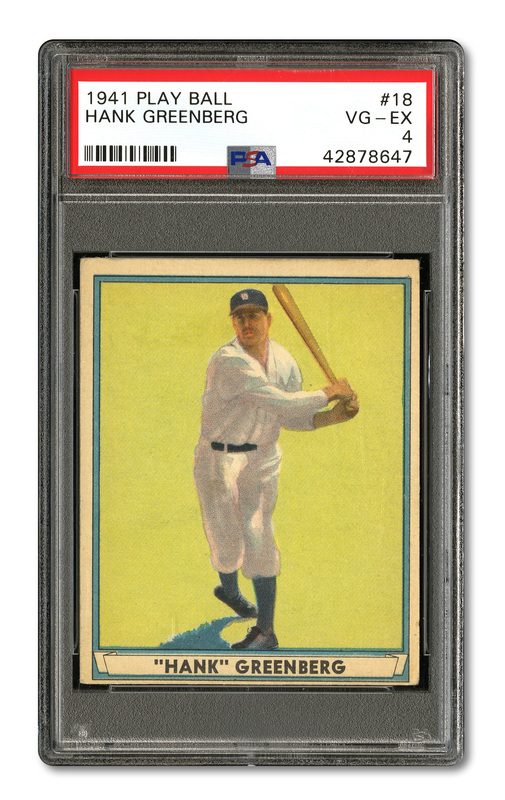 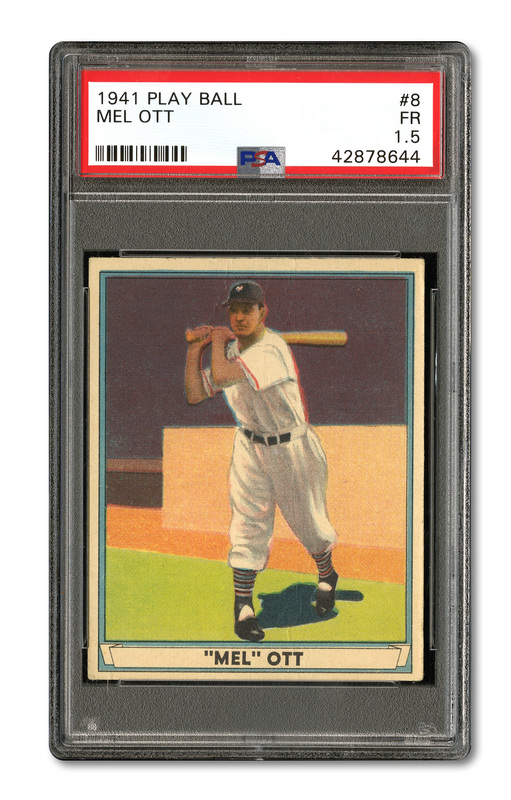 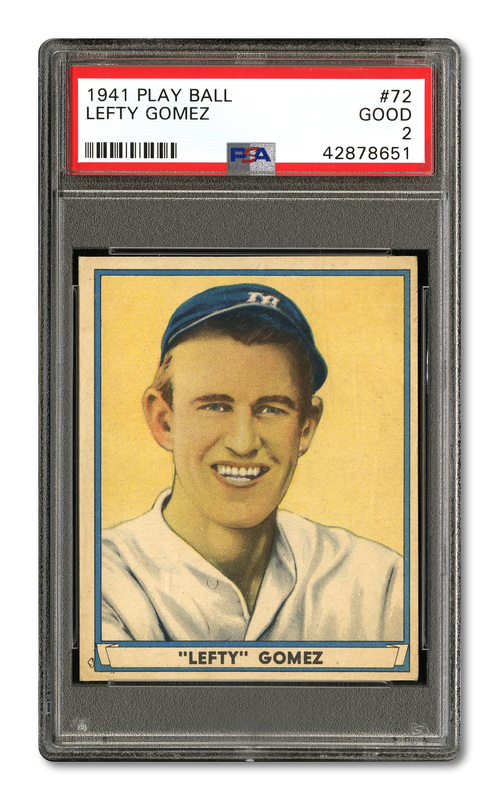 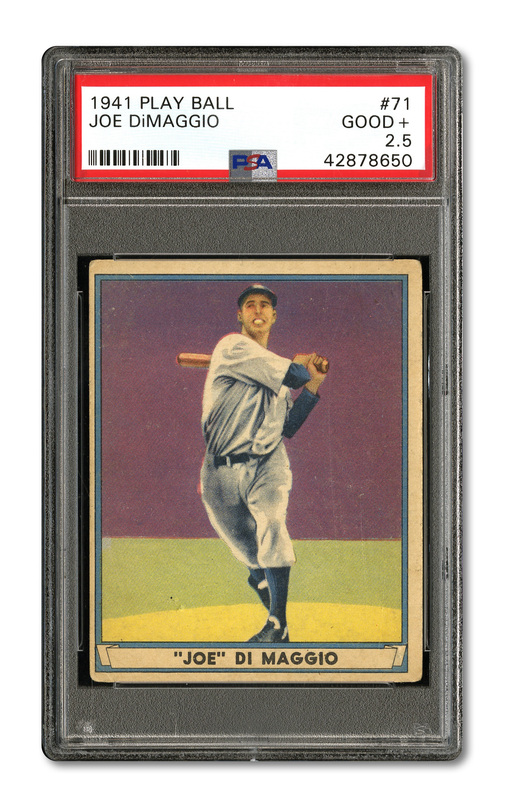 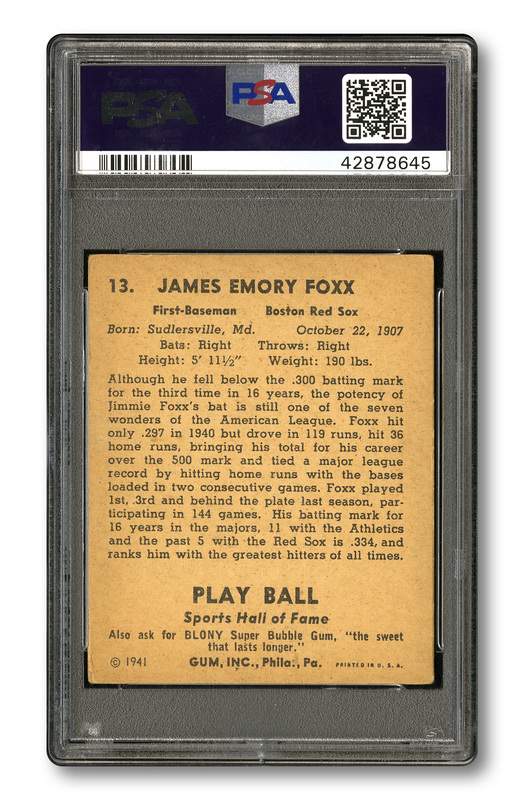 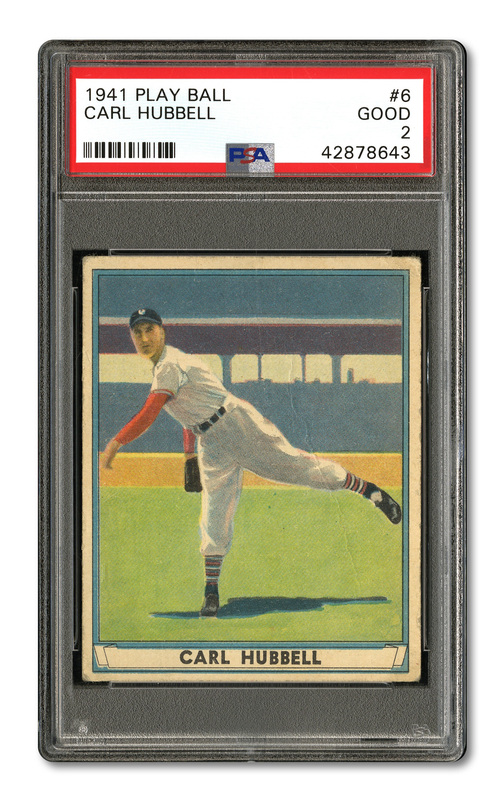 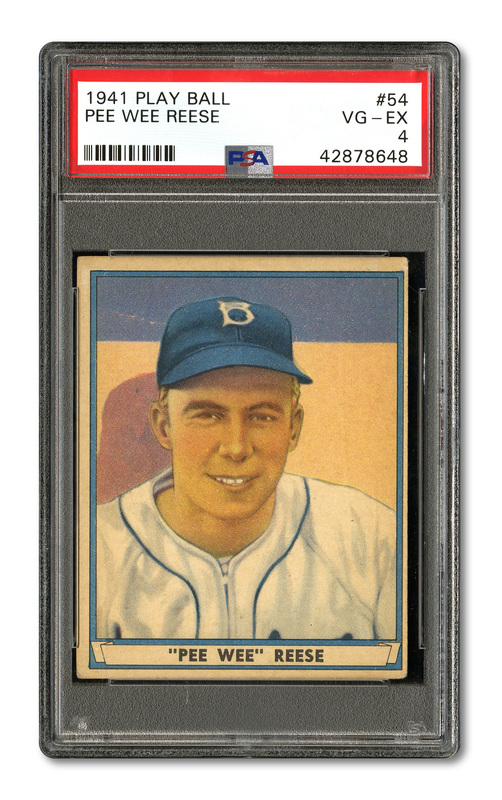 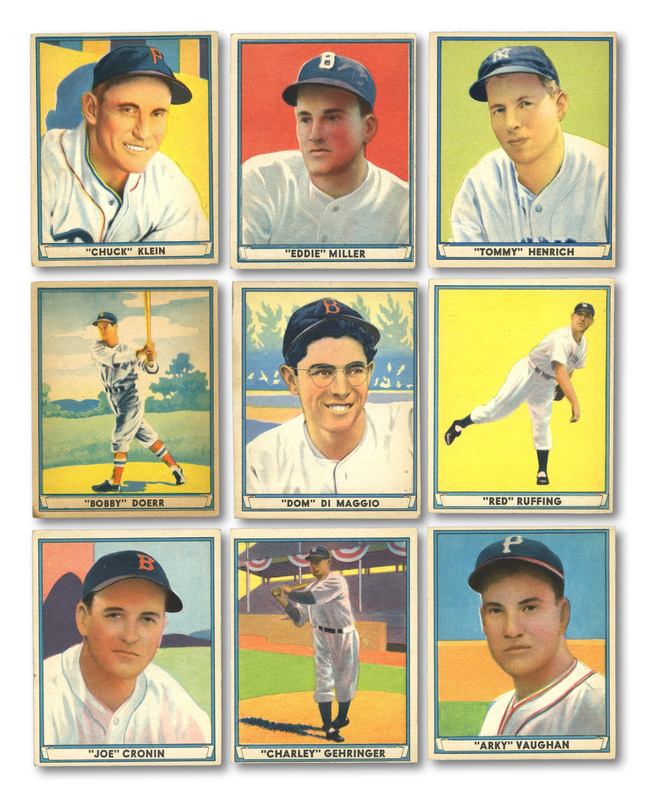 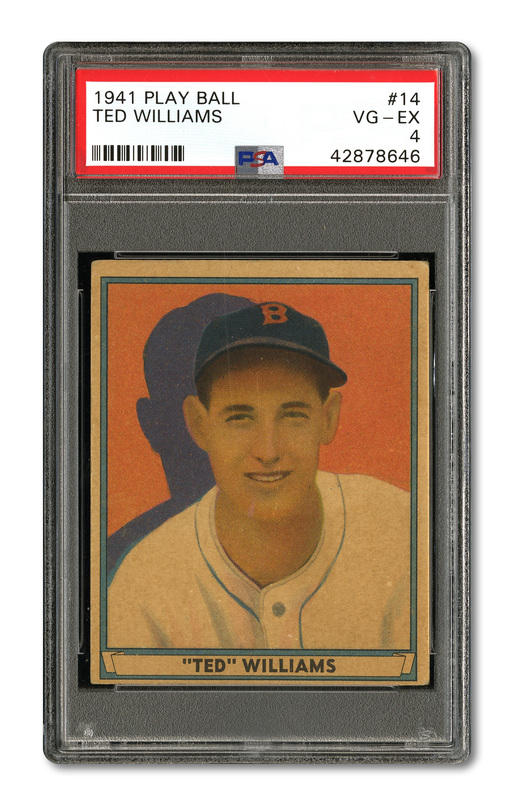 Overall, evenly matched, VG-EX looking complete set of the popular 1941 Play Ball issue with most cards appearing to fall within that range, with a few better or worse. 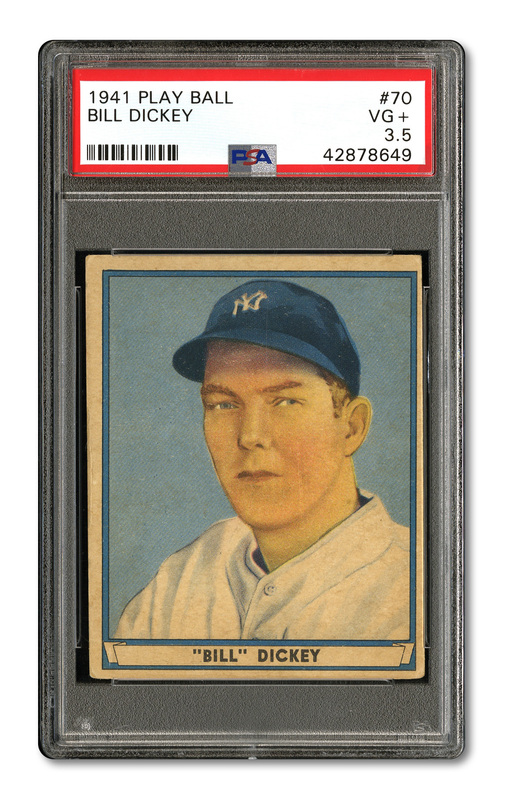 We sent the 9 key cards to PSA for grading and received the usual mixed results. Key PSA graded cards are: #6 Hubbell(HOF) GD PSA 2 (looks VG+), 8 Ott(HOF) FR PSA 1.5 (looks VG-EX w/small stain on back), 13 Foxx(HOF) VG-EX PSA 4, 14 Williams(HOF) VG-EX PSA 4, 18 Greenberg(HOF) VG-EX PSA 4, 54 Reese(HOF) VG-EX PSA 4 (looks EX), 70 Dickey(HOF) VG+ PSA 3.5, 71 J. DiMaggio GD+ PSA 2.5, 72 Gomez(HOF) GD PSA 2 (looks VG-EX). 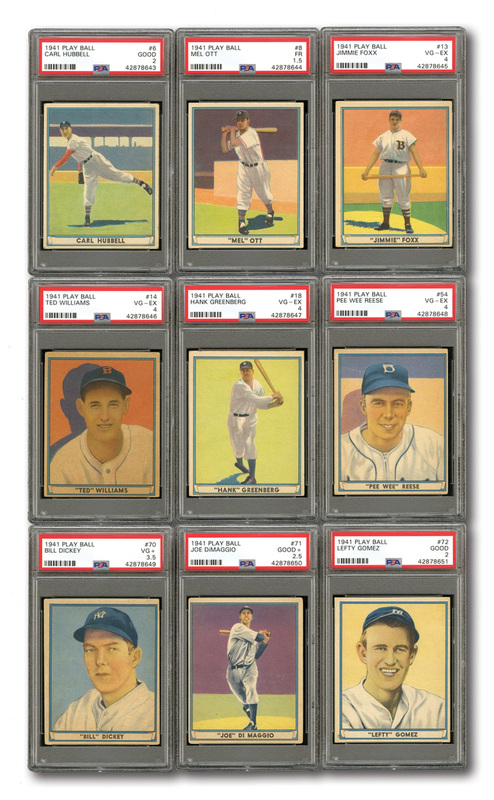 Key ungraded cards appear to be: #1 Miller VG-EX(OC), 10 Vaughan(HOF) VG-EX, 15 Cronin(HOF) VG+, 19 Gehringer(HOF) EX(OC), 20 Ruffing(HOF) EX, 39 Henrich EM, 60 Klein(HOF) VG-EX, 63 D. DiMaggio VG, 64 Doerr(HOF) VG+/VG-EX(ST). Very nice evenly matched medium/lesser grade set that displays well. 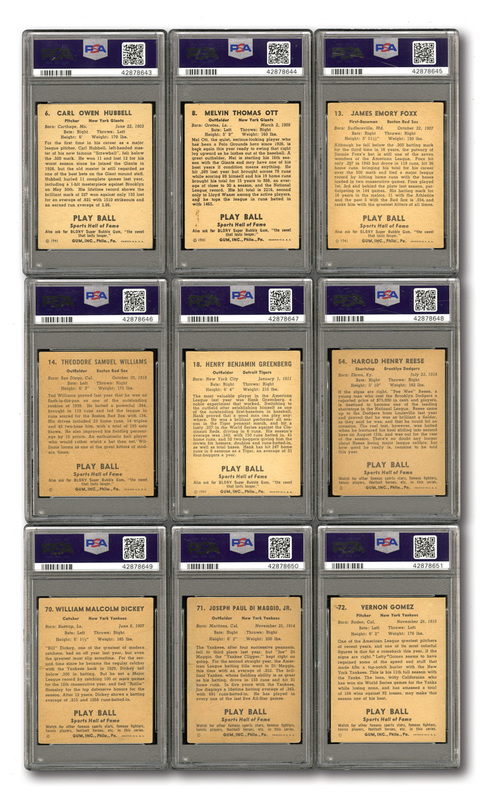 Over $1650 in SMR value for the 9 PSA graded cards alone.